Jamis Dragonslayer 3″ Mountain Bicycle Review. 2016 has been the year of “plus”–nearly every mountain bike manufacturer in the world has released a skinny-fat offering in its lineup. And while this new category of 3-inch-wide tires still needs to figure itself out, I can at least feel confident in saying that it’s great for trail hardtails. The Jamis Dragonslayer is the company’s latest addition to its line of steel hardtails, and it’s built for capability, durability and flexibility. Its 4130 chromoly tubing is triple butted for weight reduction and ride feel, and the frame features sliding dropouts for singlespeed compatibility. Since it is an obvious choice for bikepacking, it’s outfitted with rack mounts and a 3-hole bottle mount, and the traditional double triangle design means it’ll fit a large frame bag. As for geometry, some of the Dragonslayer’s numbers are right where you’d expect them for a modern trail bike designed around a 120-mil fork, with 68- and 73-degree head and seat angles respectively and 17.2-inch chainstays. But the 19-inch size sports a 16.7-inch reach coupled with stock Ritchey Trail 720-mil bars and 80-mil stem, which could be considered conservative these days. The Dragonslayer might be perfect for riders not interested in running crazy short stems on super long frames, which is the way mountain bike fit is trending. The 3-inch “plus-size” Vittoria Bomboloni tires mounted on WTB i45 TCS 27.5 rims provide oodles of traction in places where you’d expect none–a huge asset on the marbles-over-hardpack conditions at Bootleg canyon. They also grant an impressive amount of floatation in sand without feeling sluggish like a fatbike. They seemed pretty tough, too. I bottomed the tires hard enough to dent the rim at one point, without flatting or burping–and they survived the sharp, rocky terrain of Bootleg Canyon, which is a feat in and of itself. Overall, I had an enlightening and fun ride on the Dragonslayer. Each slippery corner and technical climb came and went with increasing ease, and with surprisingly little compromise. And with a $2,700 price tag, it’s a bargain, too. The 2017 Jamis Dragonslayer–a plus-size version of the company’s popular Dragon steel hardtail–will be hitting the trails later this summer with a whole lot of extra grip. Plus-size seems to be the theme here at his year’s Sea Otter Classic, with many of the top mountain bike manufacturers showing off their baby fat offerings for the first time. So why does everyone seem to be slapping 3-inch tires on bikes all at once? Boost 148, which made its debut on Trek’s Remedy 29 last year, was designed to create a stiffer, stronger 29-inch wheel–but it opened up a Pandora’s box of new bike design. The wider rear-end required bringing the chainrings out by a few millimeters, which gave bike designers much more real estate to play with. So people got creative, and tires and forks became available. All of a sudden, a new category was born. It turns out that 3-inch tires are bringing forth the rebirth of the hardtail, and with it, a whole new beginning of mountain biking. When people started riding off-road, it was purely for fun. Since then, we somehow let things get serious on us. What better way to get back to our mountain biking roots than with a steel hardtail? 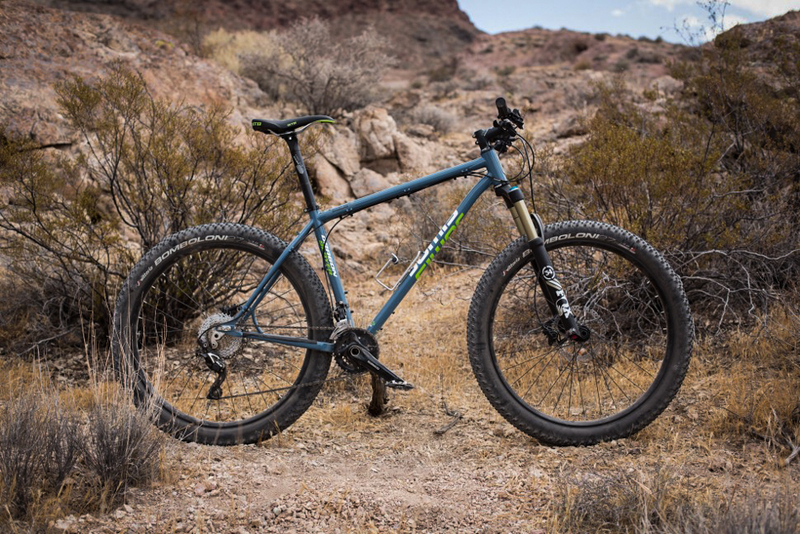 With trail geometry and the added grip and confidence that plus-size tires bring to the table, we imagine the Dragonslayer will be a full-on grin machine. You can be sure that we’ll be throwing a leg over one when it becomes available later this year. The Dragonslayer uses a now relatively narrow 73-millimeter standard English-threaded bottom bracket shell, so serious shaping is needed to get that wide, Boost 148 rear-end attached to the shell. It looks like Jamis was proud enough of its sleek chainstay yoke to slap some 3D branding on it. As you can see, tire clearance won’t be a problem on the Dragonslayer. The bike comes stock with the Vittoria Bombolini 27.5×3.0-inch tires pictured, with plenty of room for the wheel to come forward in the Dragon’s horizontal drops. Its 17.1-inch chainstays should be stubby enough for most riders as well. The Dragonslayer comes spec’d with solid parts all around. Shimano supplies the brakes and drivetrain with a mix of Deore and SLX, while the bike rolls on WTB Scraper i45 rims. Shimano is supporting Boost 148 now too, even though it was born from a Trek and SRAM partnership. This is good for everyone because for the price, you can’t beat the shift performance of Shimano’s mid-range groups. Though its name hints at the bike’s trail-destroying nature, Jamis equips the Dragonslayer for the long slog too–rack mounts are provided for the adventurer in all of us.